Originally published under the title, "ISNA's Interfaith Overreach." 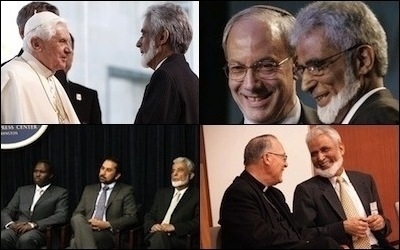 Sayyid M. Syeed, the head of interfaith relations for the Islamic Society of North America (ISNA), meeting with (clockwise from top left) Pope Benedict XVI, Rabbi Eric Yoffie, Bishop Francis Reiss, and the State Department. In its June 2015 ruling in favor of Samantha Elauf, a Muslim woman who was denied employment for wearing a headscarf, the Supreme Court reaffirmed the American judiciary's prohibition on workplace discrimination based upon religious practice. In the American melting pot, there are benefits to all faiths that successfully negotiate societal challenges between the secular and the religious, but these benefits are only guaranteed by a legal system that upholds a universal human rights standard. Blind spots in the interfaith movement, however, undermine common cause when religious leaders pursue interfaith outreach at any cost. One such example was described in an article in a Jewish community paper written by a participant in a Christian/Jewish interfaith partnership with the Muslim organization, the Islamic Society of North America (ISNA). The current head of ISNA's interfaith relations, Dr. Sayyid M. Syeed, a sociolinguist by training, is a founder and former executive of ISNA. At the invitation of its rabbi, Nancy Fuchs Kreimer, Syeed met with faith leaders of various denominations, professors of religion, and "interested citizens" at the Reconstructionist Rabbinical College (RRC) in suburban Philadelphia. The rabbi presented Syeed "to guide our thinking about these issues." Rabbi Kreimer is founding director of the Multifaith Studies Department of the RRC, the seminary of a branch of Judaism on the left side of the political spectrum and self-described as liberal progressive. Some American religious leaders are willing to pursue interfaith outreach with Muslims at any cost. In Kreimer's article, "Standing with American Muslims, Upholding American Values," also the title of ISNA's key interfaith program, the rabbi extolled the virtues of partnering with ISNA in its interfaith initiatives. She stated that ISNA is the largest membership organization of Muslims in America to support the RRC's plan to engage in "relationship-building" retreats. Kreimer's article was published in the March 10, 2015 issue of the Philadelphia Jewish Federation's newspaper, the Jewish Exponent, under its editor at the time, Lisa Hostein, whose stated priority for the paper was "inclusiveness." Kreimer's endorsement of ISNA was disseminated to the Exponent's circulation of 30,000 households. ISNA's website page, "About ISNA," states that it works with various religious organizations on a range of public policy issues to "provide...outreach programs...with religious communities and civic organizations." Touted among "ISNA Accomplishments" is that it has "condemned and rejected the actions of terrorists and terrorism as being completely antithetical to the teachings of Islam." Among the "relationship building" ISNA initiatives Kreimer referenced are the program Shoulder-to-Shoulder, part of an interfaith coalition "dedicated to ending anti-Muslim sentiment"; Walking the Walk, aimed at high school students as a project of the Interfaith Center of Philadelphia and Religions for Peace (USA); and ISNA's online resource book, Sharing the Well: A Resource Guide for Jewish-Muslim Engagement. Shoulder-to-Shoulder hosted a leadership seminar for Jewish and Christian "emerging religious leaders" who attended ISNA's annual convention earlier this month. What do all these initiatives share in common? ISNA's interfaith guide, Dr. Sayyid Syeed. Who is Dr. Sayyid Syeed? "Groups like his operate by evading legitimate queries and browbeating journalists into retreat by calling them bigots," Dallas Morning News columnist Rod Dreher observed after meeting Dr. Syeed in 2003. In 2003, prior to Syeed's current role as ISNA's interfaith guide, Syeed met with the editorial board of the Dallas Morning News to discuss how reporters "needed to partner with ISNA to promote peace and tolerance." Rod Dreher, an editorial writer and columnist at the paper who had looked into ISNA's board members, asked Syeed why, if ISNA claims to promote peace and tolerance, were so many of its board members directly connected to Islamic extremism. Syeed's mask of professorial demeanor abruptly dropped as he shook his fist at Dreher, comparing him to a Nazi inquisitor. Rather than answering Dreher's question, Syeed accused Dreher of bigotry and persecution with the veiled threat that Dreher should "repent." I told him mine was a fair question, and that I would appreciate an answer. I didn't get one. But I had learned an important lesson about how groups like his operate: by evading legitimate queries, and browbeating journalists into retreat by calling them bigots and persecutors. 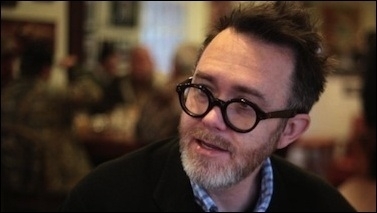 Soon after reporting his experience in the paper, Dreher found himself labeled "The New Face of Hate" on an Islamic blog because of his paper's investigative articles uncovering "alleged connections between the Holy Land Foundation (HLF) charity and Hamas." HLF is a known affiliate of the Muslim Brotherhood, a supremacist Muslim organization with its origins in the Middle East, as is Hamas, designated a foreign terrorist organization by the U.S. State Department since 1997. 'Islamophobia' is invoked by Muslim Brotherhood-affiliated groups to avoid scrutiny and restrict freedom of speech. The term "Islamophobia" is invoked by Muslim Brotherhood-affiliated organizations to avoid scrutiny from journalists like Dreher, enforce Islamic sharia anti-blasphemy laws and restrict freedom of speech. A mass media campaign to promote the use of the term was launched by the Organization of Islamic Cooperation (OIC) in 2005 as the Ten Year Programme of Action. According to the OIC's website, it is "the second largest inter-governmental organization after the United Nations which has membership of 57 Member States spread over four continents." 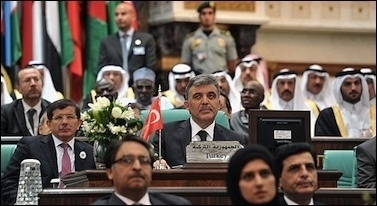 Since 1998, the OIC has pressed for a U.N. resolution to counter what it calls discrimination against Islam. The OIC's public relations campaign adopted the term "Islamophobia" from a 1997 report by the Runnymede Trust, a British think tank, to muzzle critics of sharia anti-blasphemy law. The OIC Secretary General endorsed ISNA's interfaith programs and Syeed attended a June 2013 OIC-hosted meeting in Geneva, Switzerland, held to "determine how best to implement 'measures to criminalize incitement to imminent violence based on religion or belief.'" The Organization of Islamic Cooperation (OIC) has pressed governments around the world to criminalize speech offensive to Muslims. As a result of the OIC's successful "Islamophobia" propaganda campaign, First Amendment-protected free speech in America has suffered, primarily through self-censorship. This censorship ranges from a largely complicit mainstream media to individuals intimidated by U.S. Islamist entities attempting to silence them through lawsuits, as part of an intimidation strategy that has come to be called lawfare. The "Islamophobia" label is a handy tactic employed by Brotherhood groups to shield Islamists from exposure as the OIC inches closer to their goal of criminalizing any perceived slight to Islam. Dreher's 2008 Hudson Institute article, "Reporting the Muslim Brotherhood," included ISNA as one of the U.S. Muslim Brotherhood's front group organizations. Challenging Syeed's disingenuousness, Dreher concluded that while ISNA and other U.S. Muslim Brotherhood-related groups have the right to their beliefs as long as they don't engage in violence, these groups deserve "informed opposition" to expose their hidden agendas and make them, and their apologists, accountable. A 1991 document discovered in a 2004 FBI raid, "An Explanatory Memorandum on the General Strategic Goal for the Group in North America," was a key piece of evidence in the U.S. government's successful 2008 trial against HLF, a U.S.-based Hamas terror-funding charity in the U.S. The document lists the names of Muslim Brotherhood- affiliated organizations, including ISNA, meant to carry out the movement's "settlement" plan for North America. These organizations are tasked with a "Civilization-Jihadist Process," a term author Robert Spencer dubbed "stealth jihad." The process describes a strategy that calls for "eliminating and destroying the Western civilization from within and 'sabotaging' its miserable house by their hands and the hands of the believers so that it is eliminated and God's religion is made victorious over all other religions." 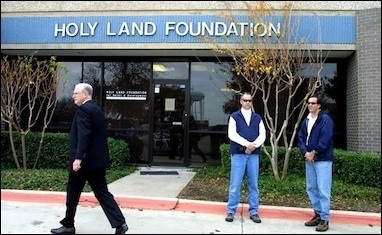 ISNA was named an unindicted co-conspirator in the 2008 Holy Land Foundation (HLF) trial. ISNA was named an "unindicted co-conspirator" in the HLF trial, a designation identifying them as having engaged in the conspiracy, although not formally charged in the indictment charging HLF, their fellow conspirators. Although they dismissively sidestepped this fact when confronted with it, ISNA carries the taint to this day. Its website home page attempts to minimize the label. ISNA, along with affiliated unindicted co-conspirators, sought to have their names expunged from the government's list by Federal Judge Jorge Solis, who had originally tried the HLF case. Solis denied their motion on the grounds that the government had presented sufficient evidence establishing ISNA as an "apparatus" of the Muslim Brotherhood. In 2012, the Chautauqua Institution in western New York State invited Syeed to share his views with its audience. A non-profit organization established more than a century ago, Chautauqua serves as an adult education center and summer resort. It provides a forum for authors, scholars and performers to speak on diverse topics ranging from the arts to philosophy, religion and current events. Syeed's lecture, "Islamic Experience in a Pluralist Democracy," began with his ecumenical version of early Islamic history under Mohammed: "It connected Muslims with Jews and Christians and it established a brotherhood of faiths... It ultimately became an empire by itself." Left unsaid was that Mohammed spread his empire with force and warfare as a ghazi, a raider, and became the leader of a warrior clan by acquiring the booty of conquered peoples and lands through military jihad. By his omission, Syeed inferred that Islamic conquests were blameless as his comments leapfrogged to the "Crusades against Muslims," saying the Crusaders came to the Holy Land "to liberate it as occupiers. Give [sic] them religious motivation to provoke them into hatred and belligerency." In actuality, the Crusades were in response to a call by the pope in the Middle Ages to relieve the siege on Christian Constantinople by the Muslims in their wars of conquest. Invoking the contemporary buzzwords "occupation," and "colonization" to trigger guilt feelings among liberal Westerners ignorant of historical context, Syeed avoided mentioning that Mohammed also united and motivated raiders to jihad with religious motivation. Syeed's implication that the Crusades were launched as an offensive war and Islam engaged in "legitimate" jihad as a defensive measure glosses over the aggressive nature of the Islamic empire's expansion under Mohammed. Similarly, other leaders seeking to amass power and territory throughout history justified aggressive expansion by claiming that it was defensive warfare. Modern-day examples are Nazi Germany's seizure of the Sudetenland in Czechoslovakia during World War II and the more recent annexation of the Ukraine's Crimea by Russia. President Obama sent a congratulatory video to ISNA's 2014 annual convention praising Syeed. Among the audience members were a few well-informed individuals who, following Syeed's Chautauqua speech, challenged Syeed by raising ISNA's tainted history. They were met with a markedly different demeanor than the one he exhibited when challenged at the Dallas Morning News meeting. With the robust growth of the ISNA organization and the welcoming policy of the Obama administration to Muslim Brotherhood organizations, Syeed exhibited charm and diplomacy. As a sign of ISNA's growing legitimacy in America, President Obama sent a congratulatory video to its 2014 annual convention praising Syeed and ISNA's interfaith program. When questioned why ISNA should be trusted as an equal interfaith partner if it was identified as an unindicted co-conspirator, Syeed haltingly and incompletely responded that "the beauty of America is that things are transparent,... go to websites,... , if any Christian or Jew... finds out ... he should report ... . If there's anything hidden, then that would be a problem." Avoiding any reference to the HLF trial, Syeed played to the sympathetic audience and dismissed the questioner with a sigh, "There are minds which already have set themselves [sic], and then they invent things." Ironically, Syeed's suggestion to "go to websites" to find out if there is anything hidden was very revealing advice. ISNA's website home page features a position paper that condemns extremism and terrorism. However, refuting its position paper's anti-terrorism message, hiding in plain sight at the bottom of every ISNA web page, is a large banner block which includes a link to a fund advisor with ties to extremism and terrorism approved by an ISNA affiliate. The unlawful use of violence or threat of violence, often motivated by religious, political, or other ideological beliefs, to instill fear and coerce governments or societies in pursuit of goals that are usually political. The ISNA position paper uses a briefer definition of terrorism as "any act of indiscriminate violence that targets innocent people, whether committed by individuals, groups or states." The paper names a subordinate group to ISNA, the Fiqh Council of North America (FCNA), whose website describes FCNA as "advising and educating its members and officials on matters related to the application of Sharilah [sic] in their individual and collective lives in the North America environment." FCNA issued a 2005 fatwa "condemning religious extremism and the use of violence against innocent lives. There is no justification in Islam for extremism and terrorism." ISNA recommended that FCNA advise Muslim leaders responsible for "un-Islamic" teachings. Insisting that "jihad is not to be equated with terrorism" and can only be "declared by a legitimate authority," "Islamic teachings are to be based neither on the actions of some present or past Muslims, nor on past or present misinterpretations, but rather on the moral principles embodied in Islam's primary authentic sources." Amana cites as an authority on charitable giving Yusuf al-Qaradawi's Fiqh az-Zakah, which says, "Declaring holy war to save ... Muslim lands is an Islamic duty, and fighting for such purposes in those occupied territories is the Way of Allah for which zakah must be spent." Scrolling to the bottom of almost every ISNA website page finds the same links advertising Islamic investing, Islamic charities, and travel agencies offering Islamic pilgrimage tours to Mecca for the hajj. The first link listed is Amana Mutual Funds Trust, a sharia-compliant financing company. The Amana button links to the "Saturna Capital and Amana Mutual Funds Trust" page. The last item in the right column, "Investing & Zakah" (investing and charity) links to a page listing zakah recipients. Pictured on the same page is Amana's downloadable pdf brochure, "Calculating Zakah." Yusuf al-Qaradawi, a charitable giving advisor, is the last reference listed on the brochure's cover. Directly below Qaradawi's name is text informing the reader that the brochure's content was reviewed and approved by FCNA. ISNA's affiliation with an accepted Islamic religious authority like Sheikh Qaradawi, who stands by his fatwa condoning suicide bombing, and has been on the U.S. terrorist watch list since the Clinton administration, is yet another example of the organization's deception. By distracting gullible faith leaders with ISNA's position paper condemning violence against "innocent lives," ISNA can stealthily bury Qaradawi's affiliation in their sharia-financing publication and deceive unsuspecting customers to support Qaradawi. As additional evidence of his extremist views, Qaradawi unrepentantly espouses that Jews do not meet the description of "innocents." 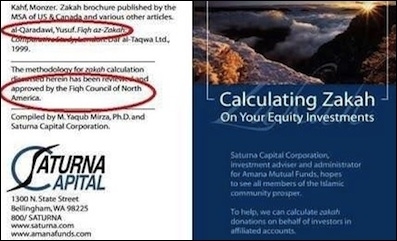 FCNA reviewed and approved the information in Amana's "Calculating Zakah" brochure and found no objection to Qaradawi's inclusion, exposing FCNA's 2005 fatwa against extremism and terrorism as a sham. Stephen C. Coughlin, an attorney and expert on how Islamic law and ideology supports jihad, served on the Joint Staff Intelligence from 2001 to 2007 as an intelligence analyst at the U.S. Department of Defense. During that time, his thesis documenting Islamic law and its relation to global jihad was accepted in August 2007. The following month, Coughlin produced the original analysis of the Explanatory Memorandum warning that Muslim Brotherhood front groups intend to subvert the U.S. Soon after Coughlin's paper was leaked, his contract was not renewed, reportedly after complaints lodged by Hesham Islam, Special Assistant for International Affairs to the Deputy Secretary of Defense under the Bush administration, Gordon England. Islam introduced England to ISNA for Pentagon "outreach." At Islam's recommendation, England attended ISNA conventions and hosted ISNA delegations at his office and Pentagon events. When conducting outreach with organizations identified as being a party to the "strategic goals" identified in the Memorandum, the gain/loss assessment of associating with them should be undertaken in light of their clearly stated hostile intent that includes the subversion of American institutions through outreach, strategic deception and perception management. To undertake outreach with known identified organizations without knowledge of their objectives is to run the extreme risk of strategic manipulation by declared Jihad entities in ways that fulfill stated Muslim Brotherhood objectives as enumerated in the Memorandum. An appendix in Coughlin's recently published book, Catastrophic Failure: Blindfolding America in the Face of Jihad, entitled "Interfaith Outreach," examined the Muslim Brotherhood's penetration to subvert interfaith communities. Referring to the book, The Quranic Concept of War, authored by Pakistani Brigadier General S.K. Malik, Coughlin highlighted Malik's key strategy. It is basically related to the strength or weakness of the human soul. It can be instilled only if the opponent's Faith is destroyed. Psychological dislocation is temporary; spiritual dislocation is permanent. Psychological dislocation can be produced by a physical act but this does not hold good of the spiritual dislocation. To instil [sic] terror into the hearts of the enemy, it is essential, in the ultimate analysis, to dislocate his Faith. An invincible Faith is immune to terror. A weak Faith offers inroads to terror. Coughlin's training and experience as an intelligence analyst qualifies him to identify and assess the methodology of "perception management," or psychological warfare. In military terminology, "psywar" or "psyops" describes influence with hostile intent, also known as information operations. Propaganda, an aspect of psychological warfare, uses misrepresentations and even lies to rally support from a target group for a cause. It includes general tactics similar to the ones Syeed used at Chautauqua where examples he portrayed as objective were in actuality distorted facts with partial historical context. The Muslim Brotherhood's gradualist strategy claims to be non-violent at the outset, but with the Muslim Brotherhood's stated intent to subvert America's "miserable house from within," it is nonetheless a weapon of psychological warfare. How better to influence policy than to cultivate the low-hanging fruit in a target population by enlisting interfaith leaders in your cause? In his 2014 book, Psychological Warfare in the Arab-Israeli Conflict, Ron Schleifer, a senior lecturer at Ariel University Center in Israel, explains psychological warfare theory as "a strategic weapon, or force multiplier" to supplement the force engaged in actual fighting. To be successful, it has to be consistent and aimed at enlisting the target population in order to undermine resistance. Propaganda requires semantics that can be easily digested by the psychological orientation of the target audience. Syeed, skilled in sociolinguistics, would appreciate the ease of appealing to a liberal American's sympathies for the perceived underdog by tweaking Western guilt in exploiting the victimhood narrative. Any inquiry that gets too close to unmasking the deception can be defused by magnifying victimhood status and deflecting scrutiny with charges of "Islamophobia," thereby effectively neutralizing any opposition. Schleifer pointed out that for psychological warfare to convey its message effectively, it cannot be delivered in a threatening tone. Rather, it requires an understanding of the cultural and social makeup of the target audience as well as a tailored collection effort that differs from standard military intelligence efforts. In Schleifer's words, "psywar intelligence seeks out the enemy's psychological strengths and weaknesses, fears and motivations, which enable skilled psywar units to manipulate enemy behavior and response." Ultimately, in order for propaganda to be effective, Schleifer pointed out that most people mistakenly think propaganda involves lies. In order to maintain credibility, propaganda agents such as ISNA and other Muslim Brotherhood-affiliates can present partial truths in ways that can convey, for example, the message of tolerance and harmony dressed in garb palatable to the targeted audience. The cumulative effect of employing key words like "Islamophobia" is to weaken the Western will, and to achieve its aims by reinforcing doubts among target groups as to the merits of their own cause, their government's policies, or even their own identities. Schleifer explained that themes of messages are meant to "demonize the enemy" (i.e. Israel), "justify war-aims" (i.e. isolate Israel and undermine political support) and, "demoralize and muzzle the target audience." When using the cudgel of "Islamophobia" to counter any resistance, success is measured by getting more interfaith followers to pledge loyalty to ISNA's cause, thereby ensuring their continued support in ISNA's divide-and-conquer strategy. Enlisting Kreimer's support was critical for ISNA's penetration since she obligingly served as a force multiplier for Syeed when he delivered his interfaith guidance to a primed audience. Reaching a larger interfaith audience via Kreimer's endorsement now gives ISNA access to cultivate more Kreimers, and the next generation of her flock, to be at ISNA's disposal. The organization can then disseminate its propaganda in the friendly environment of public relations and dawah, Islamic outreach. In today's Islamic countries, interfaith relations are at the mercy of shari'a clerics and their courts. In an upside down world of "progressive" Western culture, President Obama sent a congratulatory cable to Syeed when Syeed was honored by the US Muslim organization, the Council for American-Islamic Relations (CAIR), another of ISNA's fellow unindicted co-conspirators named in the HLF trial. However, in the Arab Muslim world where there are limited attempts to protect human rights enshrined in liberal democracies, Egyptian President al-Sisi has outlawed the Muslim Brotherhood as a terrorist organization. Congregants of genuine goodwill deserve better than partnering with entities that manipulate their good intentions. Syeed's interfaith overreach could not take root without the spiritual blindness of complicit interfaith leaders. Congregants of genuine goodwill, Muslim and non-Muslim alike, deserve better than partnering with entities that easily manipulate their good intentions. The facts are there in plain sight. Congregants need only demand the purported guardians of their faiths take a closer look to identify genuine interfaith partners. As the Dallas Morning News journalist, Rod Dreher, pointed out, "informed opposition" is the best defense to counter the Muslim Brotherhood movement. By vetting and supporting non-Islamist and anti-Islamist Muslims, Western rule of law is strengthened. This can only come about by challenging the ignorance and delusion of interfaith leaders who partner with stealth Islamists. The theme of ISNA's recent 2015 annual convention was "Stories of Resilience: Strengthening the American Muslim Narrative." Syeed's address to Kreimer's RRC crowd last March laid the groundwork to disseminate ISNA's agenda according to the Muslim Brotherhood's gradualist strategy. The ISNA conference hosted the Jewish and Christian interfaith participants of the Shoulder-to-Shoulder leadership seminar with the expectation they add to ISNA's narrative with obliging op-eds "in order to aid in the community impact." Let the believer beware. Marilyn Stern, a member of the Middle East Forum Board of Governors, writes on national security topics. Robert Spencer, Stealth Jihad, How Radical Islam Is Subverting America Without Guns or Bombs, (Washington, DC: Regnery Publishing, Inc., 2008), 4. Robert Spencer, The Politically Incorrect Guide to Islam (and the Crusades), (Washington, DC: Regnery Publishing, Inc., 2005), 125. Brigadier S.K. Malik, The Quranic Concept of War, (Himalayan Books, New Delhi, India, 2009), Chapter Seven, "The Strategy for War," 54. Dr. Anil Kumar Singh, Military and Media, (New Delhi, India: Lancer Publishers & Distributors, 2006), Chapter 2, "Media as an Instrument of Psychological Warfare," 60.